Katz And Other Tales: Our Book Katz Tales Is Up For An Award! Our Book Katz Tales Is Up For An Award! 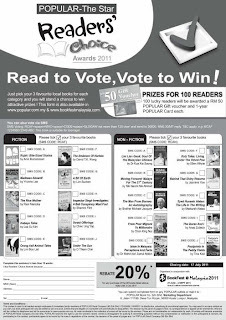 We're chuffed to announce that our book Katz Tales is one of 10 non-fiction nominations for the Popular-The Star Readers’ Choice Awards 2011. You can vote by SMS or by post. type RCAN NIRC F SLOGAN "not more than 120 character" and send to 36600. RM0.30 MT/reply. Download the form here in English and here in BM. Fill out and post. To vote choose 3 fiction and 3 non-fiction titles. 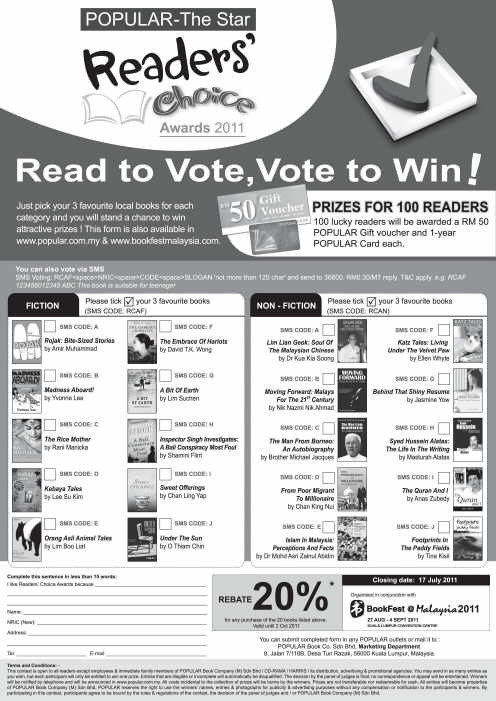 If you are one of 100 readers whose ranking matches the overall vote, you will receive a RM50 gift voucher and a one-year-free-membership Popular Book Shop card. If Katz Tales wins, we also get a cash reward, trophy and certificate of recognition. We don't know what the cash reward will be exactly, but whatever it is we will donate it to Furry Friends Farm, a no kill shelter in Selangor. In addition, you can buy Katz Tales and the other titles at a 20% discount at Popular and Harris stores nationwide from now until 2 Oct 2011. We'll vote for sure. Mama and Dad better not hide their mobiles. Here we come...That's at least 6 votes for you from this household. purrr...meow! How wonderful - good luck with it! congrate to d three of you..
Congrats and there will be 5 votes for you from this house....err, that is, if they accept our kitty MyKads that our human mum made for us, otherwise, it'll be 3 human votes minus us. That is so wonderful, if I lived there I'd vote for you too! This is very cool! Good luck! You've got MY vote(s) - I have a copy of your book and I LOVE it!!! congrats and all the best. Oh, how neat. We hope you win! We're glad to see your blog back from wherever it was hiding from us. We tried a number of times earlier but couldn't access it. Congrats on nomination! Best of luck! Concats to you> We are having trouble to get your blog to open up but have been by to visit. I voted like mad last year. Will continue to vote like mad this year too. LIM: All Rumours Are True! Mostly. Au Speaks Out: All Abowt Me!